You've planned your event, the date is set and the next thing you need to do is tell people about it. Many groups budget for advertising or marketing costs as part of their events, particularly major ones. But how can you get publicity without spending any money? And how can you squeeze maximum value from the money you do have? 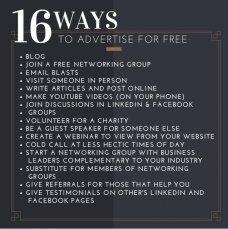 Even if you have an advertising budget - no matter what size - you should be looking for ways to leverage that paid advertising with free promotion. Here are some tips - some obvious, some requiring a little bit of work - designed to help you to get more backsides on seats or people through the gate at your next function. Use these as a starting point and see how many other ideas you can add. Start with your members and supporters. Use your meetings, regular communications, newsletters, Facebook page, Twitter feed and Instagram account to let them know about your event and encourage them to tell their friends and friends of friends. Word of mouth is still one of the most powerful selling tools because it comes with a reliable, credible endorsement. Even better, get the people who are spreading the word to carry books of tickets so that the transaction can be completed in one simple operation. If you do this you'll have to make regular checks to see who's sold how many, in order to calculate how many tickets remain and ensure the money comes in. Make sure you have your members/supporters/business partners on email and send a mass email to let them know about the event (where, when, why, cost, RSVP etc). Not only is this a very cheap form of communication, it ensures people are notified instantly, and that they can easily pass on the message to others they think might be interested. You can issue a reminder but don't misuse this power to badger people continually - that's known as spamming.